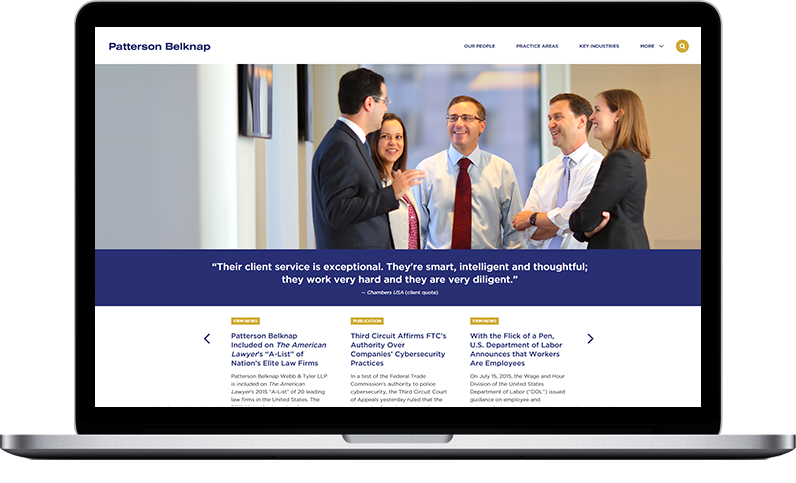 Patterson Belknap, one of the world’s elite law firms, launched a cutting-edge website that was designed and built by Great Jakes. Photo-driven Layout – The website features striking marquee photos of the attorneys “in action.” Photos were shot during a five-day photo shoot that was art-directed by Great Jakes. Like all Great Jakes websites, the Patterson Belknap site features Attorney Microsites – a unique approach to lawyer bios that Great Jakes pioneered. Attorney microsites are, essentially, small websites for each attorney that fit within the firm’s larger website. Attorney microsites can be customized to the specific business development needs of each attorney and contain any number of pages or type of content. For a great example of how the firm is using the attorney microsite functionality, take a look at Saul B. Shapiro and Craig A. Newman. Our microsite technology was also deployed for Practices and Industries. For great examples, visit the Life Sciences/Health Care industry group and the Litigation practice area.